Maybe its the season, maybe I’m feeling extra crazy because family Thanksgiving was today… I might not be hungry again for days… but I’m getting in on the Cyber Monday thing. CyberCreatures14 gives 25% off anything on my etsy site, http://CurtinsCreations.etsy.com/. Dec 1 only. Get in there! Stoppers are on the march, y’all. 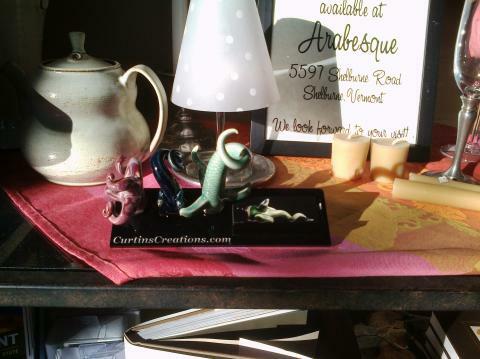 Shelburne Vineyard has them for sale, home on Shelburne Rd will be selling them when they reopen (sounds like a cool place: wine tastings, local foods, local crafts, furniture – I’m curious to see how it works out.) Block gallery in Winooski will be carrying them during their big yearly show in November. There are a few other local spots I’m looking to get into as well. All of which means: get making! 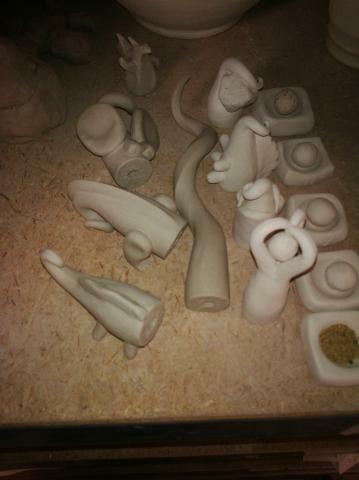 There are nine in the bisque kiln now, and I’m hoping to keep up at least half a dozen a week for the next month. Its tough being in this stage – I believe in the product, retailers believe in the product, but I’m needing to make ahead something whose rate of sale is totally unknown. One a day? One a week? A month? Here’s hoping I don’t end up with too many in stock or too few to keep stores full! Anyone have any tips on predicting this kind of thing?